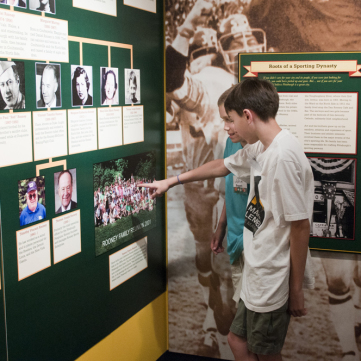 Discover the history behind the Steelers dynasty and celebrate the 40th anniversary of the Steelers’ first world championship in Super Bowl IX. Professional football traces its roots to Pittsburgh when in 1892, the Allegheny Athletic Association football team paid former Yale University All-American guard Pudge William “Pudge” Heffelfinger $500 to play against the Pittsburgh Athletic Club. Forty years later, Art Rooney Sr. founded Pittsburgh’s first professional franchise, first known as the Pirates and later renamed the Steelers. Today, the Steelers’ six Super Bowl trophies are more than any other NFL team, helping to secure an unmatched legacy of professional football in Pittsburgh. 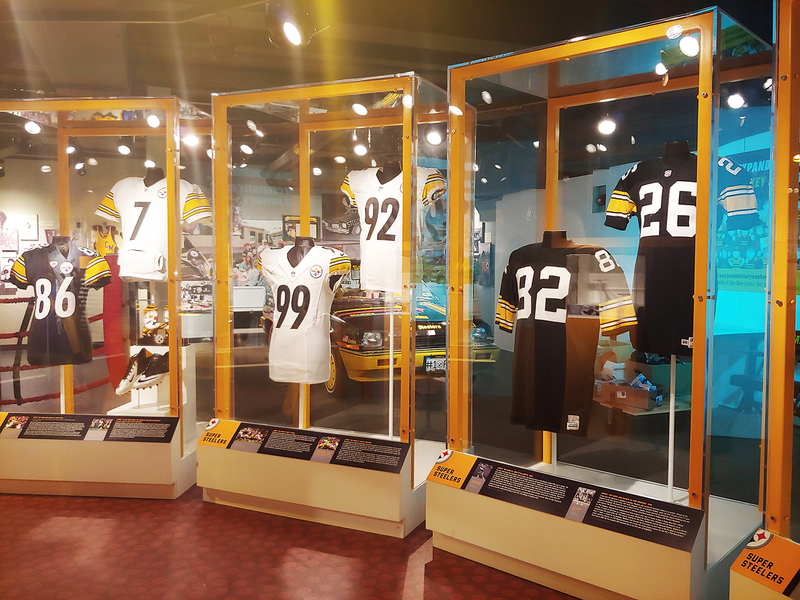 Visitors to the Western Pennsylvania Sports Museum can experience the region’s proud football legacy, from Friday Night Lights through Steelers Sundays. Explore how Western Pa. became a hot bed for high school and college football, producing nearly 50 professional quarterbacks along with four Heisman Trophy winners and dozens of All-Americans. 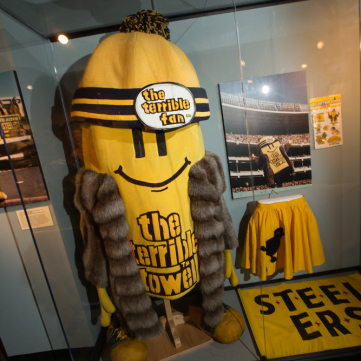 See game-worn uniforms and equipment from the Steelers’ six Super Bowl championships. Try on a Super Bowl ring, make a perfect pass to Lynn Swann and John Stallworth, and wave your Terrible Towel in a special section dedicated to the passionate fan base known as Steelers Nation. 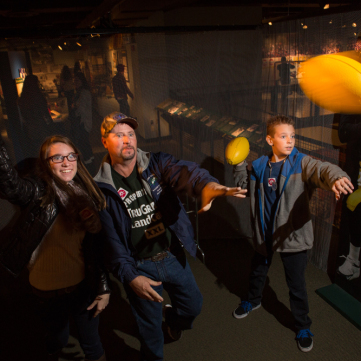 The Immaculate Reception: The Western Pennsylvania Sports Museum is THE home of the greatest play in NFL history. 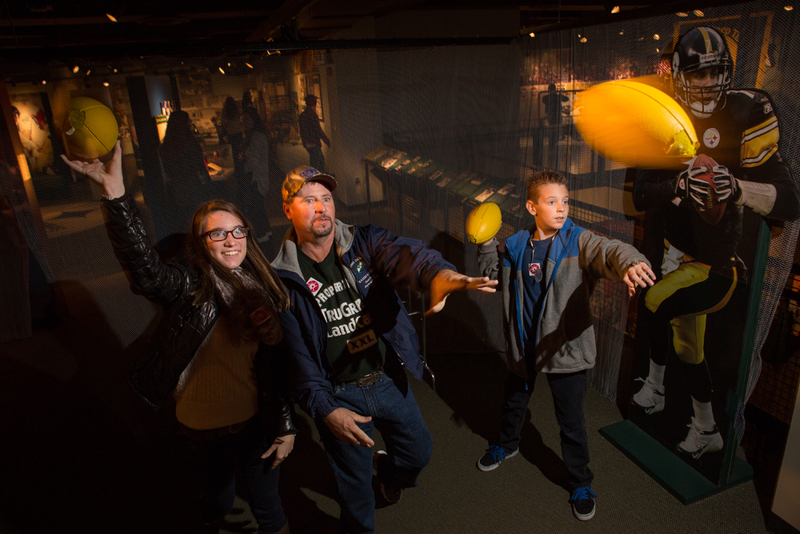 Relive the Immaculate Reception on the Sports Museum’s jumbo video screen and see the Three Rivers Stadium field turf where Franco Harris made his legendary catch-and-run to beat the Oakland Raiders in the 1972 AFC Divisional Playoff Game, changing the franchise’s fortunes forever. Don’t miss Franco’s cleats from the play and a lifelike museum figure depicting the unforgettable catch. Cradle of Quarterbacks: Is it something in the water? Western Pennsylvania has produced nearly 50 professional quarterbacks, more than any region in the country. From Johnny Unitas to Joe Montana to Dan Marino, discover what makes the region a sanctuary for signal callers. Women in Professional Football: Football isn’t just for the boys. Learn about professional women’s football in the region and see artifacts from the Pittsburgh Powderkegs and Passion teams. Learn about Western Pennsylvania’s incredible impact on football as part of these KQV Radio History Minutes recorded by History Center President and CEO Andy Masich. The Sports Museum’s football exhibition now features a special collection of game-worn Steelers jerseys on loan from Thomas and Alba Tull. 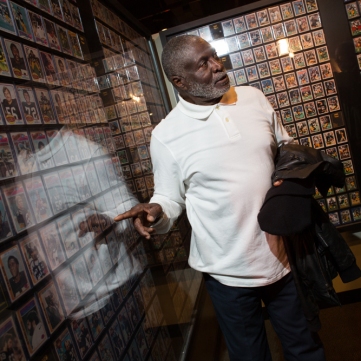 The Tull jersey collection includes Hall of Famers such as Terry Bradshaw, Franco Harris, Mel Blount, Jack Ham, Joe Greene, Jack Lambert, John Stallworth, and Rod Woodson, as well as the man known as much for his gold shoes as his fierce defensive play, L.C. Greenwood. Out of the 333 total offensive yards the Steelers generated in Super Bowl IX, Franco Harris accounted for a record 158 of them – more than the entire Minnesota Viking offense. He scored the first of two touchdowns in the Steelers’ 16-6 victory and was named Most Valuable Player. This ring, on display in the Sports Museum, was made by Jostens for the franchise’s first Super Bowl victory. 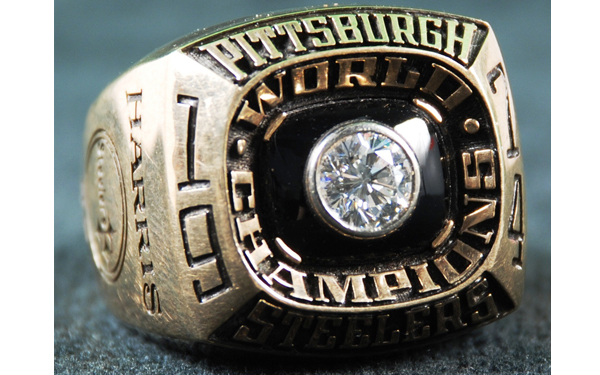 Watch Andy Masich discuss Harris’s Super Bowl ring in this video from the Pittsburgh Steelers. 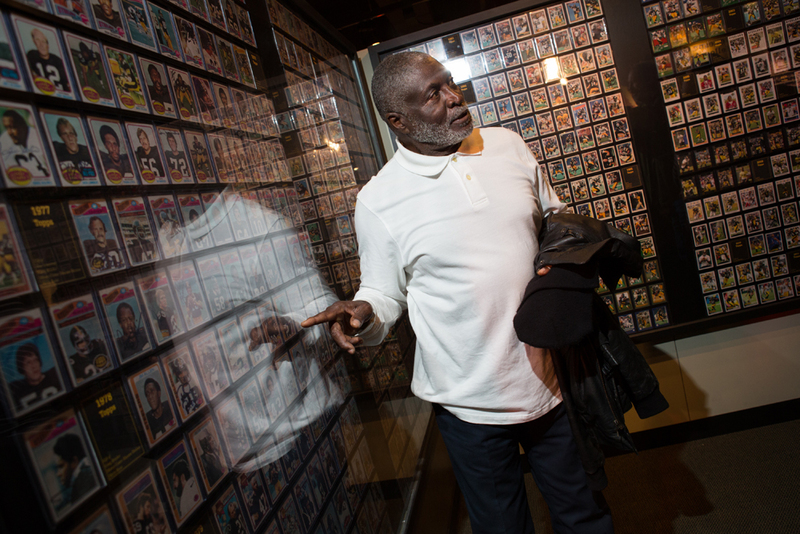 Make the perfect pass to Steelers legends Lynn Swann and John Stallworth in the Sports Museum’s football section. Diehard Steelers fan Bud Recktenwald drove this Ultimate Fan Car to and from Three Rivers Stadium to help cheer on the Steelers to victory. 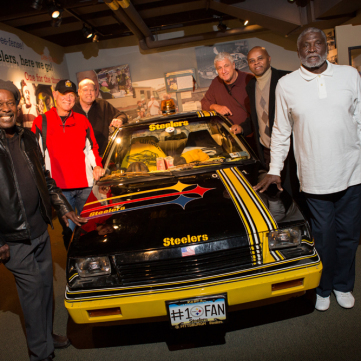 Diehard Steelers fan Bud Recktenwald drove this Ultimate Fan Car to and from Three Rivers Stadium to help cheer on the Steelers to victory. 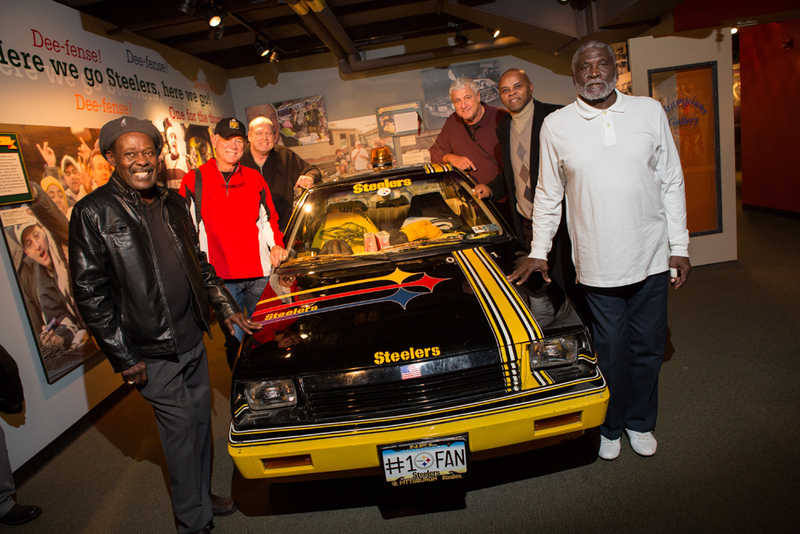 Here, Steelers alumni from Super Box IX pose beside the car. The roots of a sporting dynasty: the Rooney family. 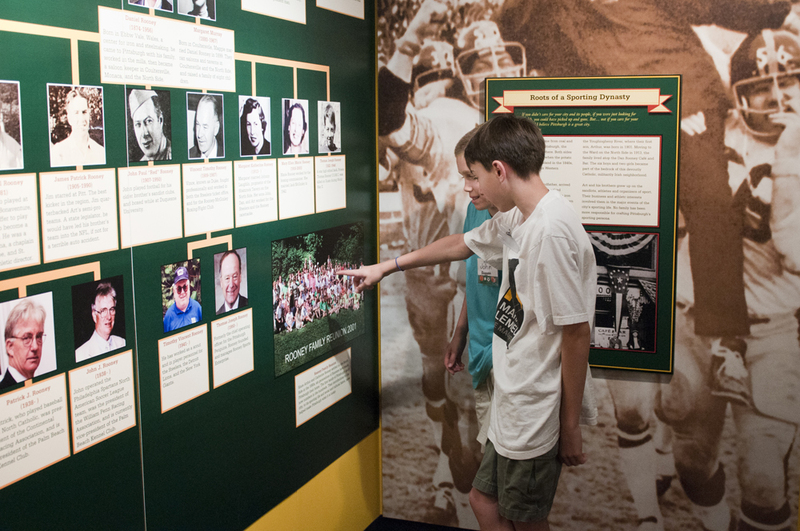 Young visitors explore the history of the Rooney family as told through the family tree wall in the Sports Museum’s football section. The Rooney family’s involvement with professional football in Pittsburgh started with Arthur Joseph Rooney, who would later be known as “The Chief.” The son of Irish-Catholic immigrants, Art Rooney grew up on Pittsburgh’s North Side near the same location where Three Rivers Stadium and Heinz Field would stand decades later. 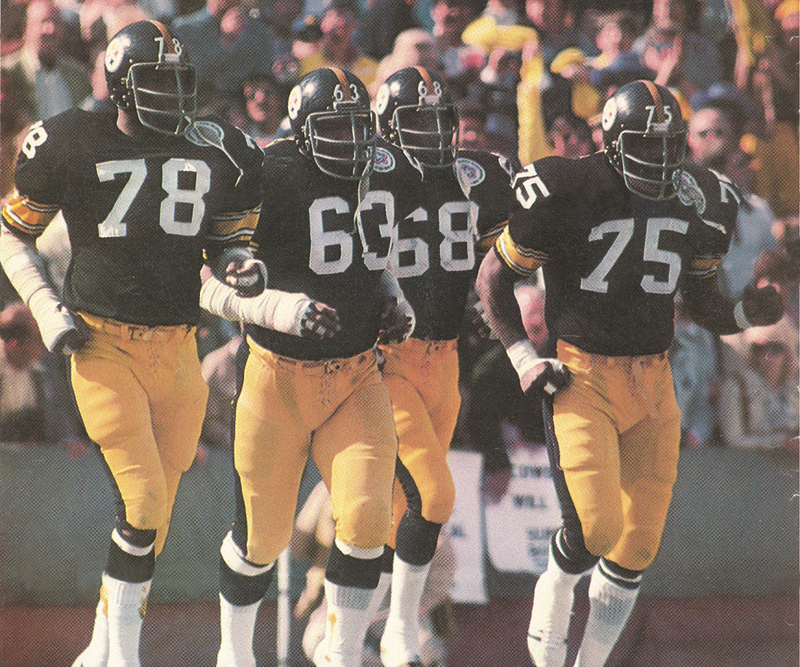 The 1970s Steelers' defense: the Steel Curtain. Joe Greene and L. C. Greenwood came first, in 1969. One was a first pick in the draft, the other a tenth round afterthought. By 1972, Dwight White and Ernie Holmes had joined them upfront. They owned the line of scrimmage, anchoring the best defensive unit in NFL history. In 1976, they shut out five opponents and held three others from scoring a touchdown. 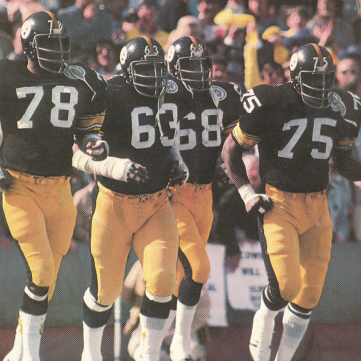 Soon, they were known as the Steel Curtain, the most feared and respected front four ever to play the game. 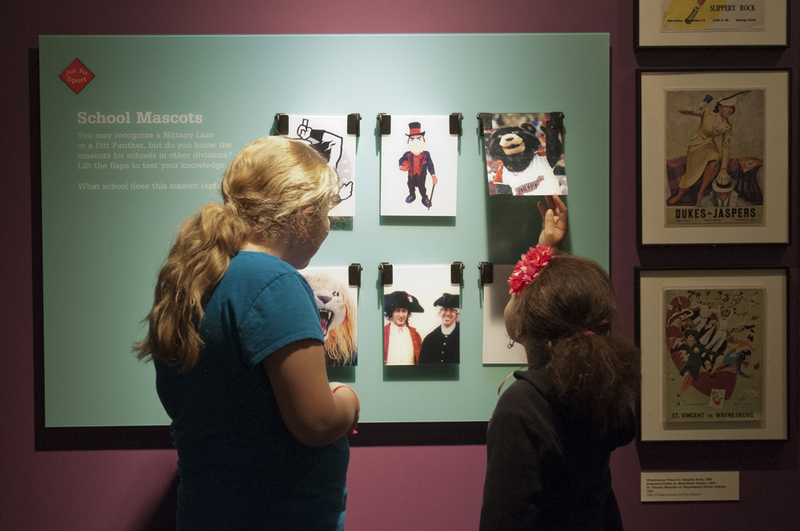 Visitors guess the mascots of local university sports teams in the Sports Museum. 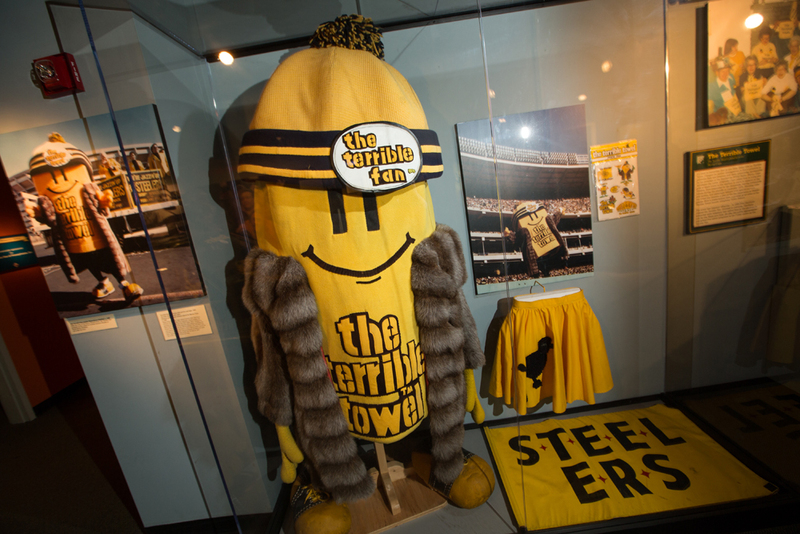 The Terrible Fan mascot roamed Three Rivers Stadium throughout the early 1980s. Beginning in 1980, high school teacher Bob Garritano donned this Terrible Fan Costume, which weighs 40 pounds and made him two feet taller. 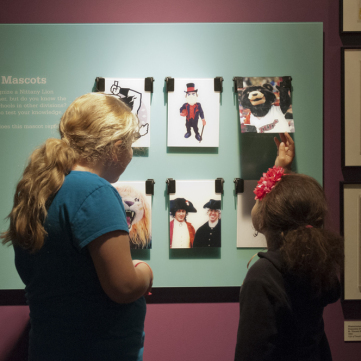 MCL Designs of New York created the costume after earlier creating the Pirate Parrot. Never an official mascot, The Terrible Fan was granted a press pass to allow him to freely travel the stands to the delight and amusement of black and gold fans. Garritano hung up his size 25 feet in 1987. Re-live all the great players from the 1930s until today. 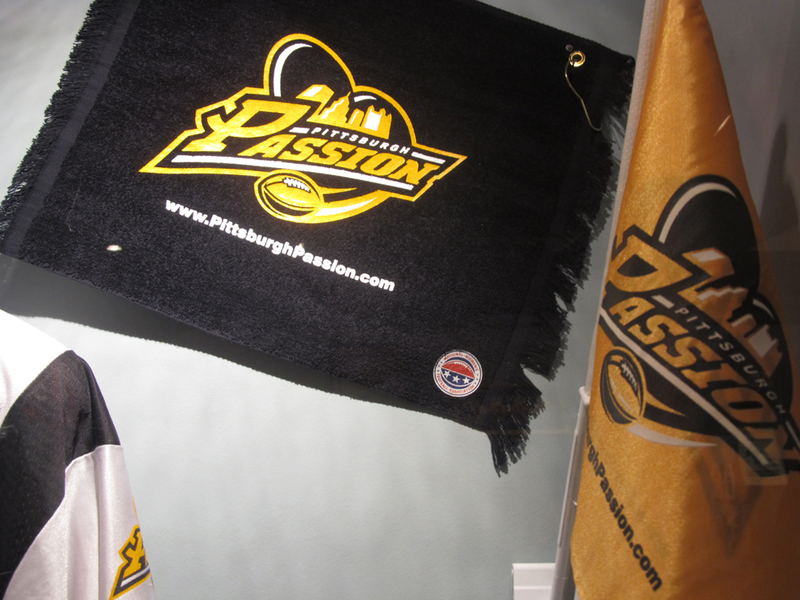 The Pittsburgh Passion is one of the most successful women's professional football teams in the United States. In line with a "terrible" tradition of Pittsburgh football, the Passion has provided fans with a familiar way to show their enthusiasm. 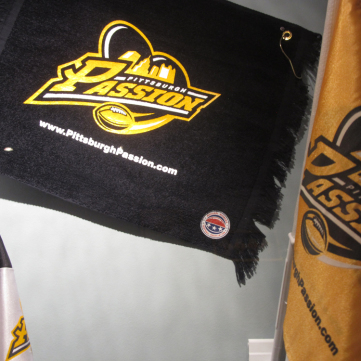 Gift of Pittsburgh Passion, Inc. The Steelers were the first team in the NFL to have cheerleaders, who were known as The Steelerettes. William V. Day, Steelers entertainment coordinator, originated the idea and recruited students from Robert Morris Junior College for the squad. 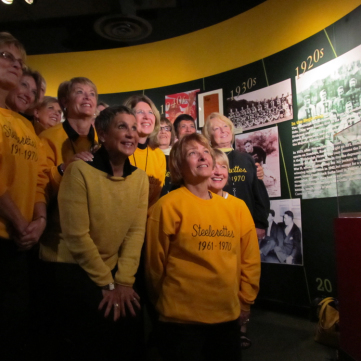 The Steelerettes cheered on their team from 1961 until 1970, when the group disbanded. 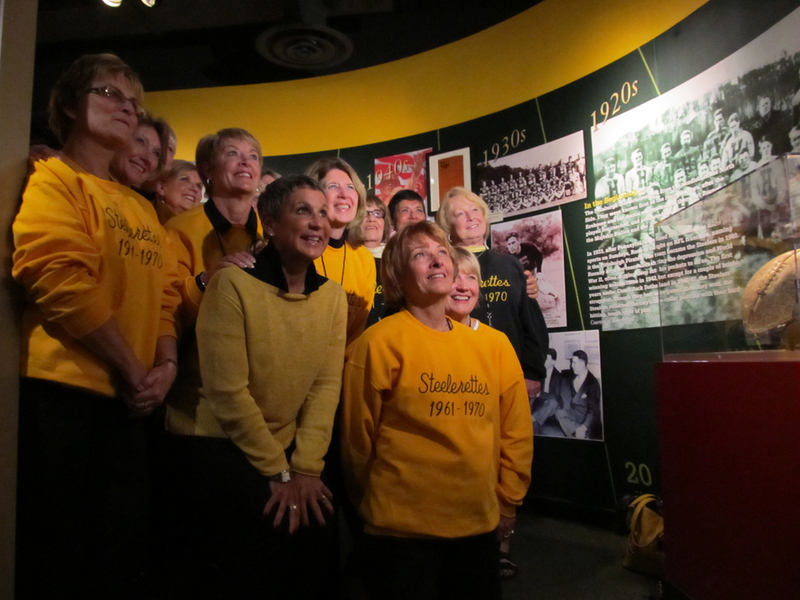 Here, the original Steelerettes alumni gather for a reunion at the Sports Museum.